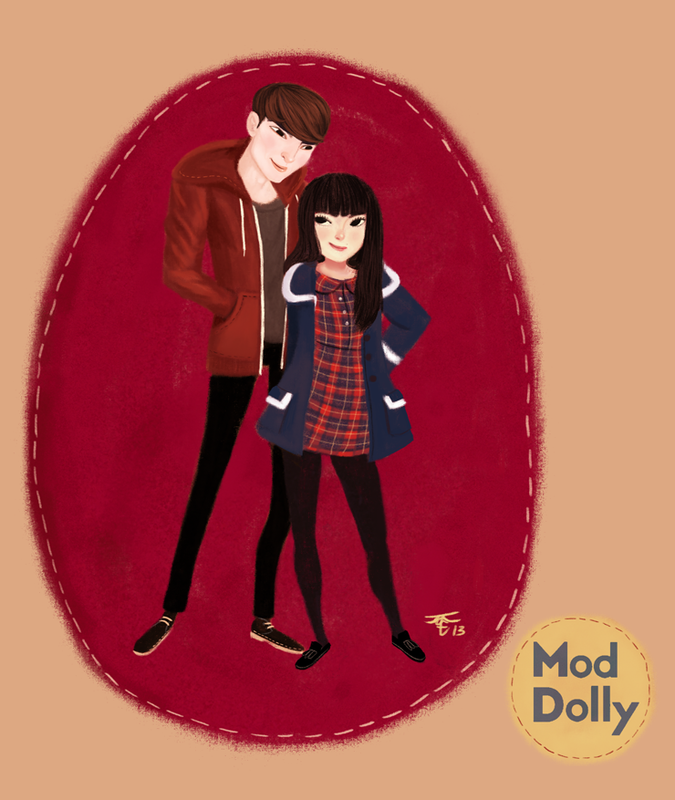 This is an illustration I did of Mod Dolly Creator, Amy He! I was very excited when I received a commission from her! I’ve always really appreciated the aesthetic and concept of Mod Dolly. i really admire what she’s done at such a young age. She’s a woman with an eye and an ambition and that’s very inspiring to me. This was a couples commission. She sent me a few photos of her and her boyfriend and requested that i draw the Beatrice Tartan Dress that she designed for her collection. She didn’t have a photo of her wearing it so I had to fill in the blanks! I figured out that I love painting tartan patterns! If you’re interested in a couples commission of you and your significant other, check out my commissions information! I love drawing couples! A commission is essentially payment for a specified task. In this case, the specified task is custom illustration! What you’re paying for is my time and my talents. I work very hard to deliver a quality product and my prices are quite modest. I take my work very seriously so I have to politely request that i receive serious inquiries only. Because of my LookbookIllust blog I get a lot of interest from fashion bloggers who want me to draw their looks. I absolutely LOVE doing this! The illustration above is a commission for Styleblog.ca Founder and Editor, Nelia Belkova. She sent me the photo to the left and a list of slight modifications to her look and I came up with the resulting illustration! I’ve had people send me photos of themselves and outfits that they want me to put them in; those are always fun! Here is an illustration of Henar Vicente of OH MY VOGUE. I draw in many different styles. If there’s a specific style you’d like me to draw in please let me know. I’ll just improvise if you don’t specify. The best way to tell me which style you’d like is to look at my blog, LookbookIllust and tell me a specific illustration that caught your fancy! I charge and additional $7.00 if you want to add another person. I love making art for couples. I’ve made several anniversary and valentines day gifts for people in the past. A custom illustration of you and your loved one is a unique and one of a kind way of expressing your adoration for your significant other! I love painting pets! The second image of the three dogs is an illustration I did for my boyfriend’s family. They absolutely loved it and it’s currently hanging in their house over their piano. Often people approach me to illustrate their own ideas and concepts! Often these are more complicated than what I generally do and require days of time, planning, etc. The first illustration was for upcoming Hip Hop Artist, Dola who sent me a long list of ideas and requirements for the cover of his album. The second illustration was for a friend of mine who wanted to surprise his son with something dinosaur related! The parameters were less complex than Dola’s but just as complicated to execute. They were both very very pleased with what they got in the end. I’ve tried to edit this info as much as I could. I hope that i’ve made things clearer! I accept payment via Paypal and I only send final images after payment is confirmed. If you are unfamiliar with paying via paypal, here is a very short and easy to understand tutorial. I figured I’d show you guys some commissions that I’ve recently completed. I’ve opened up Commissions just a few days ago and I’ve been busy. Makes me feel kinda happy. 😀 I love being productive and feeling like I’m working, even if it’s fun work! Commissions are open! Rosie sent me an email with the details of an outfit and I bought it to life and put it on her~!!! I’m always open for commissions so if you’d like a drawing like the one above, feel free to email me at Kathrynwilkins@me.com after checking out the Commission info!